Products of T C M Associates Ltd.
With over 30 years experience in the design and manufacture of biomaterials for orthopaedic applications TCMA have utilised their expertise in successfully bringing to market a range of osteoconductive βTCP synthetic bone substitutes. GranOS is a synthetic osteoconductive scaffold, which is used by orthopaedic surgeons treating defects of the skeleton such as fractures, and in specialist surgical techniques such as spine surgery. GranOS consists of a highly pure three dimensional porous matrix in granular form which has been designed to mimic the function of human cancellous bone. GranOS is regularly and successfully used in place of both autograft and allograft bone. GranOS functions because the chemistry and porous geometry of the phase pure beta tri-calcium phosphate exactly mimics the same parameters of human bone. The human body responds to the implantation of GranOS in a similar way to its response to autograft. The material is slowly resorbed and converted to new bone by the action of the normal cellular physiological process. 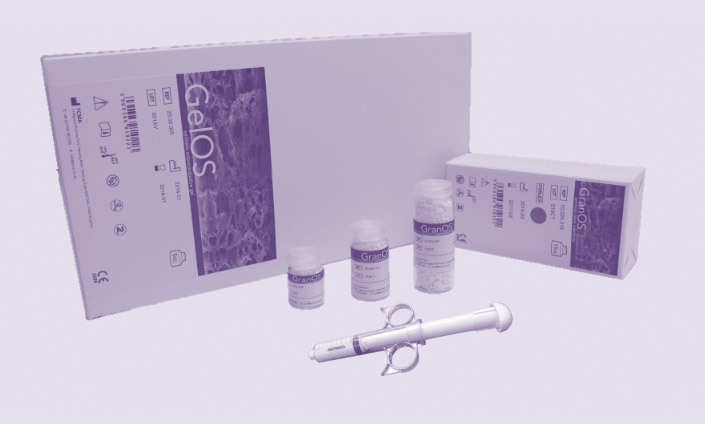 GelOS synthetic osteoconductive gel can be implanted directly into bony voids or defects of the skeletal system (i.e. long bones, extremities, spine and pelvis). The water soluble carrier then dissolves leaving behind the calcium phosphate matrix which is resorbed and replaced with bone during the healing process. Both these products come in a range of volume sizes.